Put on your best cocktail attire and come enjoy complimentary wine tasting, hors d’oeuvres, desserts and more at The Leopold’s Crystal Ballroom, 1224 Cornwall Avenue, Bellingham. Listen and dance to live jazz music and participate in a silent auction that raises money for Alzheimer’s Society of Washington. Tickets are $30 per person; additional information and ticket sales available online. 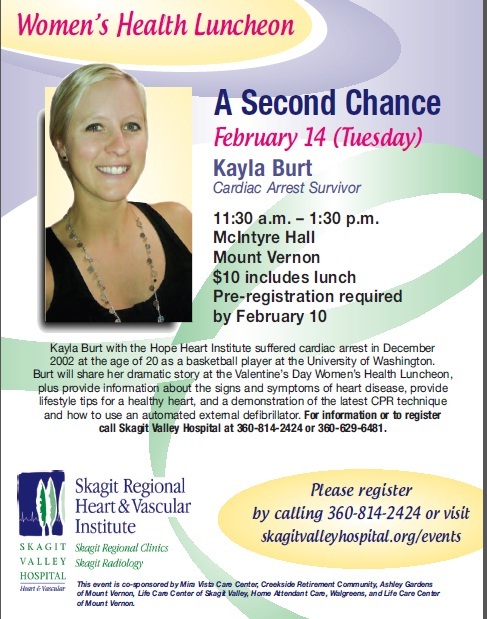 Home Attendant Care Sponsors Guest Speaker at Skagit Regional Heart & Vascular Institute: February 14, 2012. Join us in Skagit County on Valentine’s Day for this affordable and informative women’s health luncheon. Simply register online through this link.